We are a professional manufacturer of stainless steel pipes, stainless steel angle and stainless steel flat bar. All products are certificated by international organization, like ISO9001 international quality management. 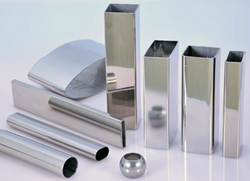 We produce several types of stainless steel pipes for mechanical and structural purposes, like stainless steel square pipes and stainless steel rectangular pipes. We can even supply specially made stainless steel pipe according to your different requirements with high quality and competitive price. Please contact us for further information. We hope to serve you in the near future.